A Navy corpsman attached to the Marines' elite special operations unit will receive the services' second-highest award for valor for working heroically and selflessly to treat wounded Marines in Afghanistan after he himself was wounded by a makeshift bomb. Chief Petty Officer Justin Wilson, 36, a special amphibious reconnaissance corpsman attached to MARSOC's 1st Marine Special Operation Battalion, will receive the Navy Cross in a Nov. 25 ceremony at Camp Pendleton, California, according to an official release. In the same ceremony, fallen Staff Sgts. Christopher Diaz, 27, and Nicholas Sprovtsoff, 28, will be posthumously awarded Bronze Star with combat distinguishing devices. Diaz and Sprovtsoff were killed in the same blast that wounded Wilson. 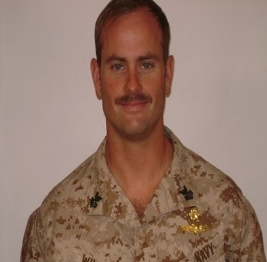 On Sept. 28, 2011, Wilson was on his third deployment to Afghanistan with Marine Special Operations Team 8113. He volunteered to accompany Sprovtsoff, the team's explosive ordnance disposal technician, to remove an improvised explosive device from a nearby checkpoint manned by the Afghan Local Police in the Upper Gereshk valley of Helmand province — a dangerous and sensitive task. Sprovtsoff was just beginning his task of inspecting the device when there was a large explosion. The EOD tech was severely wounded, and Wilson was disoriented by the blast. Even though he knew it was likely the insurgents had placed more IEDs nearby, Wilson knew what he had to do. According to his medal citation, the corpsman immediately left his safe position and searched around the checkpoint until he found Sprovtsoff. While he was tending to the wounded Marine with the help of Diaz and another team member, another IED detonated. The blast wounded Wilson severely, and ultimately led to the death of the two Marines. In the chaos, and despite the shock of his injuries, Wilson became single-minded. "Ignoring the pain of his own injuries, [Wilson] focused solely on treating his fellow team members," his citation states. "He dragged one outside the checkpoint and rendered aid until he succumbed, and then searched for the other casualties, who had been blown over the barriers by the second blast. Only after confirming they were already dead did he allow treatment of his own wounds." Wilson, who has previously received the Purple Heart and the Bronze Star with combat distinguishing device, will be pinned with the Navy Cross by Maj. Gen. Joseph Osterman, commanding general of MARSOC. He will be the sixth service member attached to the command to receive the Navy Cross since MARSOC was created in 2006, and the first MARSOC sailor to receive the award. 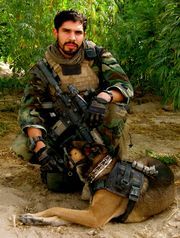 Diaz, who was a military working dog handler with team 8113, will be honored posthumously with the Bronze Star with combat "V" for selflessly working to save Sprovtsoff after the initial IED blast, even though he knew there were likely more explosives hidden at the site. Sprovtsoff's Bronze Star with "V" will recognize his heroic work to remove the IED that would claim his life, as well as heroism displayed in a prior combat engagement. 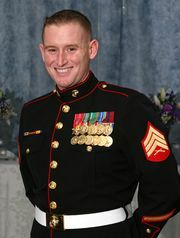 According to his Bronze Star citation, Sprovtsoff bravely led a team of Marines safely through a region filled with IEDs after the team came under multi-directional fire from an enemy ambush on May 20, eight days before his death. His work over the course of the team's deployment resulted in the elimination of 40 explosive devices, officials said. Sprovtsoff's story was featured in Oliver North's 2013 book, "American Heroes on the Homefront: The Hearts of Heroes."